← Guitar Master Class giveaway! I received an email in my inbox today about a pretty cool looking competition starting on Wednesday 27th October over at R&Rworld, a community built for unsigned musicians, music fans and industry professionals. 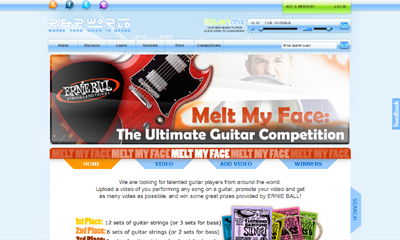 The “Melt My Face: The Ultimate Guitar Competition” is contest where you upload a video of yourself playing any song or solo on the guitar. Members will vote, and the ones with the most votes will win prizes. R&R World, the community for unsigned musicians and artists, is hosting a competition for talented guitar players from all over the world. The deal is to upload a video of yourself playing any song or solo on the guitar, and get as many votes as possible during a one month voting period. The winners will be rewarded with numerous sets of Ernie Ball strings, and the 1st place owner also gets coverage on the front page of Guitar International online magazine! After the 1st round winners are announced, the votes for other videos will be reset and will continue taking part in next round of voting in December. About R&R World:R&R World was created as an online place to bring together unsigned musicians, music fans, and industry professionals. There are numerous tools, resources and services for artists to build their careers and expand their audience. A variety of new music from independent bands from all over the world provides the perfect place for music lovers, and the opportunities for experts and industry pro’s to share their knowledge and experience, promote their business, and network throughout the industry are numerous. This looks like a cool contest, good luck to all those who enter.